So much for having my car done by the end of summer! There's always next summer, I suppose. The last two months have been a complete waste of time as far as my Jensen Healey is concerned. Other projects and just not enough time in the day have taken their toll. Much to my dismay, I have found it impossible to remove the stupid front crank timing belt pulley. I have a Mark I, and Mark Is don't have the advantage of having holes tapped into the pulley for using a pulley removal tool. Naturally, the crank front cover is shielding this pulley from access and can only be removed with the pulley already off the crankshaft. Easily the worst design on the entire vehicle. You'll want to get this thing tapped before reinstalling (in the unlikely event you'll have it off). Normally, heating the pulley and applying some pressure in just the right spot with a cold chisel and a puller arm will release it. But NO! This one has to be seized onto the shaft. I spent a good three hours trying everything to no avail. By this time I became so enraged that I figured I'd just tear down the stupid thing by the end of the day instead of Mickey-mousing around with it. Grrr. Probably just as well, since I want to see what the insides are up to. This is my stock engine, the supposed 27,000 mile original unit (ahemm) that ran perfectly before being parked and ignored for years. We've all heard that one before. The 2.2 rebuild is still on hold awaiting an additional infusion of cash. Hopefully, Richard at West Coast Cylinder head isn't charging me a storage fee yet on my parts. So, this means a minimal amount of new parts for the stock engine (so much for being on a budget) while still actually doing what needs to be done to make this a proper rebuilt engine that will last years. Should be a good science project. 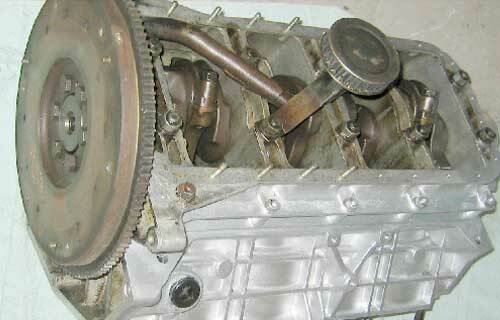 At the moment, I've taken stuff to my local machine shop and have them looking at the cylinder head. All internal moving components will be getting a precision balance too, something sorely needed that didn't get much (any?) attention from the Lotus factory when new.